﻿ H.G. de Wolff - Paradoxen van modernisering"
Paradoxen van modernisering is not a book about economics. At the time, already twenty years ago, your reviewer studied the book in order to get a better understanding of the present-day society and of the cultural developments. However, on reflection the discussed topics do matter also for the economic science. Actually the social modernization and the economic progress are mutually reinforcing. This pertains definitely to the advancing rationalization and differentiation. Both of these dimensions are indispensable for an improved productivity and division of labour. Besides, this idea is not new. Already in the nineteenth century the Historic School forms within economics and advocates a multidisciplinary approach, which extends beyond market phenomena. The economy interacts with the historic developments. And this complex process is explained well in Paradoxen van modernisering. The authors Hans van der Loo and Willem van Reijen employ a truly inter-disciplinary approach, where the sociology, the psychology, the anthropology and the philosophy are all addressed. Actually they must do this, since they want to write an introductory textbook for the general social sciences. The economic science has always suffered from her extremely simple view of human nature. The other social sciences can fill in the lacune. And in those cases where the economic view is wrong, the other sicences can explain why the economic models yield faulty results. This also allows to clarify why economic institutions function adequately in some societies, and fail miserably in others. A universal policy such as the Washington Consensus is deficient. It is alarming that especially the monomaniac economists dominate the global institutions, which decide about the granting of credits. 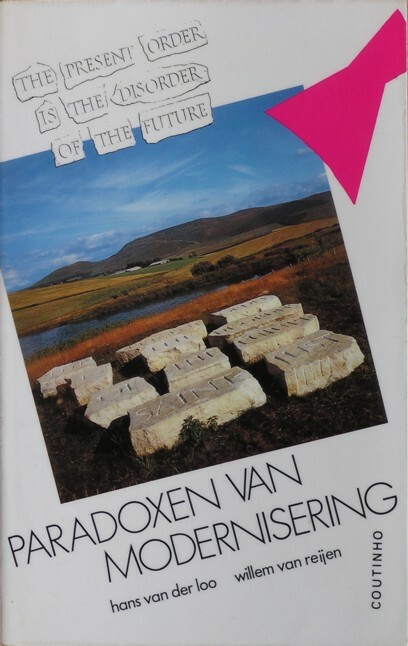 Paradoxen van modernisering wants to address lots of aspects, and thus it is an exacting book. The reader is informed about the existing paradoxes, but he or she must search for his own truth. The authors themselves conclude often, that the truth lies in the middle. But in science this is an unsatisfactory find. The reviewer forgoes the opportunity to discuss all those dilemmas, and restricts himself to a stock-taking of the topics, that are relevant for economists. Incidentally, also the other paragraphs and chapters will contribute to the personal development, even though they lack economic relevance. The book focuses on the social changes. This fits well in the picture of technological progress, but naturally it conflicts with the economic premise of universality. The authors place the turn towards modernization in the Renaissance of the fifteenth century - indeed, they restrict themselves to the western culture. This is the moment, when the traditional mystic and myth are abandoned, and replaced by scientific and technical insights. Society begins to attach value to the reality, which is observed in empirical research. The individual, who before felt like a powerless part of nature, rises to the position of ruler of nature1. The community spirit is replaced by commerce and competition. This amounts to the awakening of humans as autonomous beings, and to an increasing individualization. Especially during the Enlightenment of the eighteenth century the attitude towards progress becomes positive, and furthers a uni-linear development. People trust in innovation and believe in growth. Unfortunately the need for existential security is neglected. The ideas of the Enlightenment degenerate into a disgusting exploitation under the Manchester capitalism2. The positivism has never really recovered from this failure. In spite of liberal protests the morals and ethics appear to be essential. Therefore in the late nineteenth century the bourgeoisie supports the common people with a program of civilization. The power remains in place, but he becomes more humane. The division of labour has played a decisive role in history. She causes the urbanization, and subsequently the industrialization. The rationalization and the individualization form a vertile brooding ground for democratization. The classes grow blurred. It is striking that here the authors ignore in a systematic way the rise of mass organizations3. Besides the modern European and Asiatic examples show that multiple growth paths are possible. This is explained by means of the paradoxical nature of modernization: the division of labour creates both differentiation and pluralism and a growing mutual dependency. The individual is forced to control his emotions, and to adapt to the collective. There is freedom and commitment, and autonomy in impotence. The western history from the Middle Ages onwards is just as paradoxical. The rise of the cities creates decentralized power centres. The decentralized urbanization is characteristic for Europe, and among others Max Weber relates her to the Calvinistic ethics, which emerges in the sixteenth century. God is placed outside of nature. The individual loses the certainty of the here-after, and is placed in a mental isolation. The cities begin a mutual competition. Perhaps this is the reason that the urban centres develop a need for a central authority, in the form of the absolute monarchy, which becomes the bearer of the violence monopoly. The structure turns out to be equally important as the culture. The authors do not believe the biological models of the late nineteenth century, which portray the individual as a victim of passions and instincts. They prefer the view of Norbert Elias, that the personality is formed by socialization and civilization. This has the consequence that the human mind changes with time. In modernism the individual is a goal-rational hedonist, who for his identity is dependent on mass consumption. He develops his own life-style and life plan, and a keep smiling attitude. Here the reader recognizes the homo economicus or the homo sovieticus - there are always several growth paths. Yet the individual experiences his limits, because in this way all sense disappears from life. Sociologists such as Weber and Emile Durkheim state that the society becomes anonymous. Henceforth the power is exerted by the big business and by the state bureaucracy. The economy obtains her own structure due to the foundation of all types of functional institutions. In the anonymous society the human commitment or solidarity is no longer self-evident, but she must be organized. Individualism within the anonymous society seems to be a paradox. But Van der Loo and Van Reijen trust the individual rationality, and their view of human nature approaches the ideal-type of the modern economy4. Indeed economics pays attention to market frictions and to search behaviour. The individuals operate within loose networks, where they continuously change and optimize their contacts. The mutual responsibilities are temporary and volatile. Perhaps the most shocking conclusion of Paradoxen van modernisering is that the social growth does not emerge in a spontaneous way. The progress is never linear. The favourable historic circumstances are a crucial condition. It becomes clear why for a long time the humans were content with a bear skin, a club, and a cave. This incites reflection. Can the present-day globalization obstruct growth-paths? When will goal-rationality be an obstacle? In any case it is obvious that the economic universalism is a mistake. The morals can not be dissolved in a pluralism. A common just ethics remains indispensable. That is the economic message that your reviewer learns from Paradoxen van modernisering.